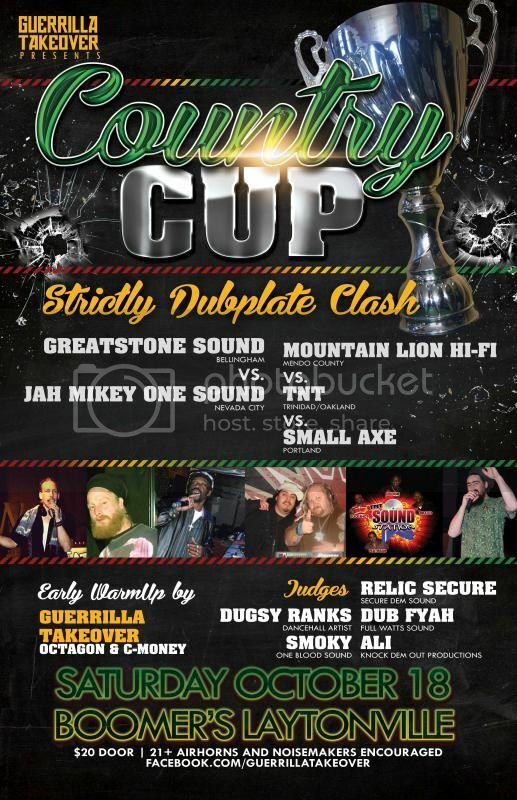 Guerrilla Takeover presents Country Cup all dubplate sound clash October 16 at Boomers in Laytonville. A historical event being the first official sound clash in Nor Cal. Five sounds featured from the west coast, Greatstone from Bellingham Washington, Small Axe from Portland Oregon, Jah Mikey One Sound from Nevada City, Mountain Lion Hi-Fi from Mendo County and rounding out the lineup, TNT from Trinidad/Oakland. Early warm by Octagon and C-Money of Guerrilla Takeover, this clash features judges who will help determine a winner, sound veterans Smoky from One Blood Sound, Dugsy Ranks dancehall artist, Ali of knack-dem -out productions, Relic Secure of Secure dem sound and Dub Fyah of Full Watts round out the panel. Come support original sound system vibes here in the 707, do not miss one night only the Country Cup !! Big up all the SNWMF massive and crew. Edited 4 time(s). Last edit at 09/28/2014 01:47AM by Octagon. Respect to all the sounds involved!!! were not even in the clash but we voiced dubs EVERY day this week... time to line up the next MUSICAL WAR!!! Tomorrow night 4 sounds ago dead and 1 sound gonna walk wwith a real nice trophy! Edited 1 time(s). Last edit at 10/17/2014 09:14PM by tahoearmada. Stay Positive Sound will be rolling out. Meeting up in the parking lot around 10pm to smoke some splits before it starts at 10:30. Hope to see some of you out there supporting the event. bwoy... today gonna be a long day but one things for sure: tonight 4 sounds ago dead!!! i'm heading north in a couple hours..... see ya there! YT SMALL AXE AH DI WINNER!